Lapointe, Pierre Louis. "Saint-Laurent". The Canadian Encyclopedia, 04 March 2015, Historica Canada. https://www.thecanadianencyclopedia.ca/en/article/saint-laurent. Accessed 19 April 2019. The city gets its name from the road, Côte-Saint-Laurent (now Metropolitan Boulevard), that ran east-west, in the centre of Île de Montréal. The road was used by French settlers at the turn of the 18th century. The parish set up under that name in 1722 and it became a village in 1855. Saint-Laurent, Qué, Borough, pop 84 833 (2006c), 77 391 (2001c). Incorporated in 1893, Saint-Laurent grew from a mere 1225 inhabitants in that year to become the second most important industrial centre in Québec after Montréal. In 2002 it was merged into the larger city. Saint-Laurent lies in the northwestern part of MONTRÉAL adjacent to the city of DORVAL. The borough is one of Canada's main high-tech manufacturing localities including aeronautical, pharmaceutical, telecommunications and biotechnological manufacturing sectors. It was chosen as the site for a research and development park, Technoparc, because of its proximity to Montréal International Airport at Dorval. Saint-Laurent's oldest educational institution, the Collège de Saint-Laurent (now a CEGEP) was founded by the Pères de Sainte-Croix in 1847. The college became famous for its theatrical company, Les Compagnons de Saint-Laurent (1937-52), founded by Father Émile LEGAULT. 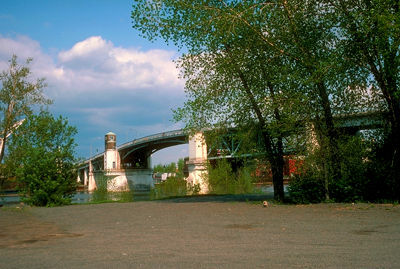 During its existence, it was a training ground for some of French Canada's best-known actors. The college's old neo-gothic chapel, an art museum since 1978, houses rich collections of religious and popular art.